The Tool Bar. The Tool Bar provides easy access to commonly performed operations. Here is a complete description of each item. B. Lift Pen. Pressing this button causes the simulated drawing pen to be lifted from the paper. This is useful when you want to change patterns mid stream or begin drawing the same pattern at different point on the image. Lifting the pen allows it to move to new location without drawing connecting line between the old position and the new one. C. Mode. The Mechanism operates in three modes. Here is a description of each one. 1. Two-Wheel Mode. In this mode, there are only two wheels rotating. Each wheel has an adjustable circle around interior of the wheel. The arm-structure attaches to a point on this radius line. A smaller radius produce smaller motion on the arm when the wheel rotates. A bigger radius produces a bigger motion. 2. Outer Planetary. In this mode, each of the main wheels has an additional smaller wheel that is attached to the inner circle described above. 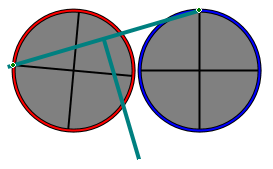 Changing the radius of the circle increases or decreases the size the smaller wheel.The smaller wheel rotates in the opposite direction from the main wheel. This is similar to what a planetary gear would do if it engaged teeth in the outer rim of the main wheel. The arm-structure attaches to a point on the radius of the wheels and this produces different, more complex patterns than Two-Wheel mode described above. 3. Inner Planetary. This mode is identical the "Outer Planetary" mode except that the smaller wheel that rotates in the same direction from the main wheel. This is similar to what a planetary gear would do if it engaged teeth in the inner axle of the main wheel. This produces a different complex motion of the arm-structure. 1. Pantograph. In this mode, the mechanism resembles a Pantograph which is used by artists to trace drawings. 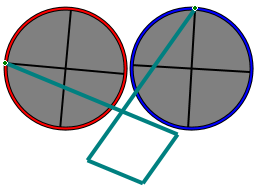 The pantograph tends magnify certain motions of the circles. For example, it tends to convert variations in the phase between the two wheels into vertical movements of the pen. 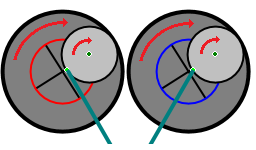 Since the wheels themselves tend to produce side-to-side motions, the combination of vertical and side-to-side motion produces more symmetrical patterns. 2. T-Bar. The T-Bar mechanism works differently and produces different patterns from the Pantograph. With the T-Bar, the right-hand attachment point remains fixed, while the left attachment point slides along the length of the top cross-bar. The T-Bar tends to convert phase difference between the two wheels into horizontal movement of the pen. This produces more arching patterns. E. Saved Patterns. The program display a drop-down list of saved patterns. Selecting one of the patterns from the list sets all the parameters in program, allowing you to duplicate that pattern. The program comes with a set of default patterns that give examples the possible types of patterns you can create. You can save your own patterns by pressing the "Save Pattern" button. You will be prompted for a name for the patter and then all the parameters for the pattern will be saved to disk. The next time you run the program, the saved pattern will appear in the list. F. Anti-alias Lines. Enabling this option causes the program to draw anti-aliased lines, which are smoother, with no jagged edges. 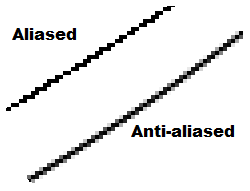 As you can see in the image to the right, the anti-aliased lines have additional gray pixels around the line which makes the line look smoother. Generally, you want to use Anti-aliased lines. However, some of the mosaic options work better with Aliased lines. G. Step Button. The Step Button turns the wheels one time-step. This is useful for visualizing how the rotation of the wheels affect the development of the pattern. It also allows you to see how various settings affect the position of the arms and, ultimately, the pen.